Caroline Still Wiley Anderson, physician and educator, was born in Philadelphia, Pennsylvania to William and Letitia Still. Supporting his family through coal mining investments and a stove store, William Still, a prominent antebellum abolitionist, helped escaped slaves on the Underground Railroad. He wrote about these fugitive slaves in his book The Underground Railroad. Caroline Still attended Mrs. Henry Gordon’s Private School, The Friends Raspberry Alley School, and the Institute for Colored Youth. At sixteen, she went to Oberlin College where she was the only black woman in her class. After graduating from Oberlin College’s Literary Course in 1868, Still moved back to Philadelphia to teach. In 1869, she married Edward A. Wiley, a former Alabama slave, who she met at Oberlin. Before Wiley’s death in 1873, they had two children, William and Letitia. Caroline Wiley left Philadelphia for Washington, D.C. and Howard University where she was hired to teach music, drawing, and elocution. Once there she decided to become a medical doctor. 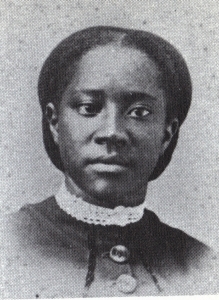 After attending Howard University Medical School for one term, Wiley transferred to the Women’s Medical College of Pennsylvania in 1876. She graduated in the spring of 1878 and then interned at Boston’s New England Hospital for Women and Children. When she returned to Philadelphia in 1879, she became one of the state’s first black female doctors. In 1880, Caroline Wiley married Matthew Anderson, a Doctor of Divinity and founder of Philadelphia’s Berean Presbyterian Church. The couple had three surviving children, Helen, Maude, and Margaret. In addition to her private medical practice, Anderson worked with her husband to serve Philadelphia’s poor women and children. She ran the Berean Dispensary and the Berean Cottage on the New Jersey coast. She also helped found the Berean Manual Training and Industrial School and then acted as its assistant principal and teacher of elocution, physiology, and hygiene. At the beginning of the 20th Century she fought to establish Philadelphia’s first black Young Women’s Christian Association (YWCA). Until she suffered a stroke several years before her death, Anderson remained involved in a variety of community and professional organizations. She was treasurer for the Women’s Medical College Alumnae Association and president of the Berean Women’s Christian Temperance Union. She also was a member of the Women’s Medical Society and on the board of the Home for Aged and Infirm Colored People of Philadelphia. Margaret Jerrido, “Caroline Still Anderson,” in Notable Black American Women, ed. Jessie Carney Smith (Detroit: Gale Research Inc., 1996); Darlene Clark Hine, “Co-Laborers in the Work of the Lord: Nineteenth-Century Black Women Physicians,” in ‘Send Us a Lady Physician’: Women Doctors in America, 1835-1920, ed. Ruth J. Abram (New York: W.W. Norton and Company, 1985); Susan Wells, Out of the Dead House: Nineteenth Century Women Physicians and the Writing of Medicine (Madison: University of Wisconsin Press, 2001).